Paul Merson has tempered enthusiasm regarding Arsenal's progress, predicting they will be on the end of a thrashing soon due to their poor defence. 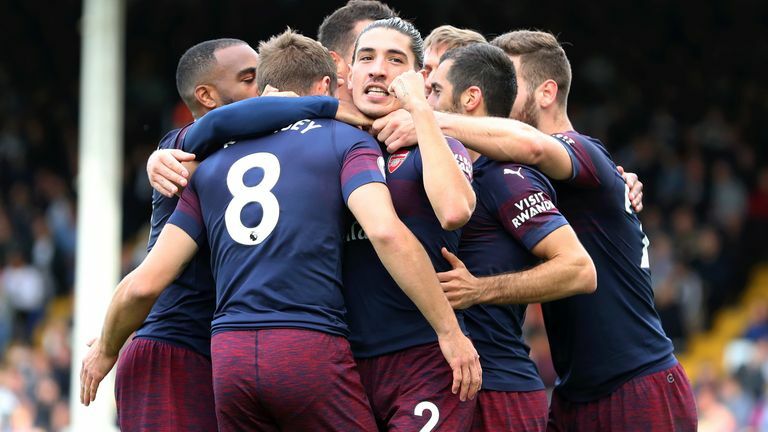 Arsenal made it nine wins in a row in all competitions in emphatic fashion with a stylish display in a 5-1 victory at Fulham on Sunday. The Gunners moved level on points with Tottenham and are just two points off the top three of Liverpool, Chelsea and Manchester City. Despite their impressive run of results under Unai Emery, Merson sees a big gap between Arsenal and the teams above them due to their lack of stability at the back. "Sooner or later they will be on the end of a big score - defensively they are all over the place," he told The Debate. The Gunners fans were in full voice during the Fulham win, singing "we've got our Arsenal back" - a nod towards the positive work done by Emery since replacing Arsene Wenger. He said: "Arsenal were brilliant under George Graham, then Arsene Wenger took them onto another level. But because the last few years haven't been as good, they [Arsenal fans] think they've got their club back? I don't get it. "I've not understood Arsenal fans for the last three or four years. Arsenal are an unbelievable football club. They've always had a certain class about them, incredible, the marble everywhere at Highbury, there was a certain standard about that football club. "The fans were always switched onto everything but in the last few years they've disappointed me - maybe that's just where football is now. Every club that has won a trophy believes they have a right to win all the time."